Leave No Trace is one of the most moving motion pictures thus far of 2018 and it achieves its power without resorting to the overt manipulation favored by many movies. An atypical coming-of-age story, the film examines the relationship between a father and daughter while posing questions about issues as diverse as the rights of a parent and the value of forced assimilation. The film is non-judgmental and doesn’t take an obvious position on any of these issues, instead presenting them as elements of the overall narrative and allowing the viewer to make his/her own determinations. 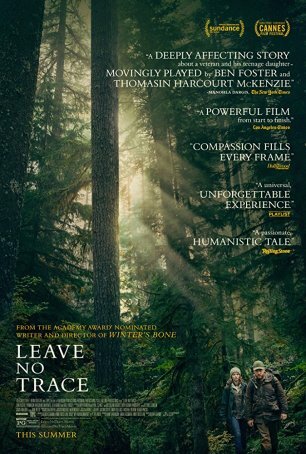 Leave No Trace doesn’t exist to push a particular political agenda; its purpose is simpler and more meaningful – chronicle the events that oblige the characters to re-examine whether they can continue as they have for an unspecified number of years prior to the beginning of the film. The story is divided into three clearly-delineated parts, each of which shows an important aspect of the evolution of the characters. The first establishes who they are and what they’re doing. Background details are sparse. They’re sufficient, however, to flesh out the specifics of their current situation. We learn, for example that Will (Ben Foster) and his teenage daughter, Tom (Thomasin Harcourt McKenzie), have been living “wild” in an Oregon national park, occasionally relocating to avoid the notice of the rangers and other patrols. Will is ex-Military with obvious signs of PTSD. He is a single parent. His wife’s death isn’t discussed in detail, although it apparently happened some time ago. His teenage daughter remarks that she wishes she could remember her mother. Will and Tom live like survivalists. Their world is one of mosses, mushrooms, and green vegetation. It’s like an alien planet. They have a small campsite. They build fires to keep warm during the chilly nights and occasionally venture into a nearby town to visit the VA (in a sequence that’s a low-key indictment of how veterans are treated) and buy supplies. Will pushes Tom hard but is never abusive. For recreation, they play chess and Tom reads from an encyclopedia. The intimacy between them is palpable and their communication often occurs without words. Academically, she excels. Later, she is forced to interact with others when the authorities apprehend her and her father and move them into a small house. Will’s choice is to accept a job he’s being offered by a local businessman harvesting Christmas trees or risk losing Tom. Questions are posed but not answered. Is Will a fit father? Have his war experiences (and his lack of adequate post-overseas treatment) left him incapable of raising a child? Leave No Trace is sympathetic to him but consider these questions from an unbiased point-of-view. And, although Tom is smart and skilled, can she integrate into society? Should she be required to? (These are similar to themes addressed in 2016’s Captain Fantastic.) The bond between father and daughter, which has been developed over the course of perhaps ten years of co-dependency, is strained once outsiders come into the picture. The natural inclination of the teenager is to rebel and, although this has been suppressed in the wilderness, it emerges in a more conventional setting. Will loves his daughter. That much is clear. But many of the things he does are not necessarily in her best interests. He is driven by his own demons and an increasingly resistant Tom is pulled along in his wake. There’s a sense that a breaking point is coming. Tom is fast approaching a level of maturity when she will be able to make her own decisions and, as she points out, what’s wrong with Will isn’t wrong with her. He can’t cope with society’s constraints. He must be on his own, isolated and free from the pressures imposed by a community. Tom wants to be with other people and learn things her father can’t teach her. She comes to understand that he’s broken and, although they love each other, that’s sometimes not enough. Leave No Trace features two of the year’s best performances. For character actor Ben Foster, a familiar face who has appeared in films as diverse as X-Men: The Last Stand (where he played Angel), Hell or High Water, and Hostiles, this is an opportunity to show that he can shine in a lead role as well as a supporting one. Foster’s performance is carefully modulated. He portrays Will as an obviously damaged individual who is in complete control. He rarely emotes but his deep affection for his daughter is evident. New Zealand actress Thomasin Harcourt McKenzie is Foster’s match. She embraces the contradictions of her character with strength and passion, showing not only Tom’s deep connection with her father but her desire to spread her wings and grow beyond him. The character is conflicted and the actress portrays that conflict perfectly. Debra Granik is best-known for Winter’s Bone. In that film, as in this one, she showed the ability to provide a window into the mindset of a teenage girl. Her rapport with her lead actress in each case – Jennifer Lawrence in Winter’s Bone and Thomasin Harcourt McKenzie here – has resulted in insightful, emotionally honest performances. Leave No Trace is not showy. It moves slowly enough to breathe but not so slowly that it seems to drag. The photography of the wilderness is evocative and the contrast with “modern life” (as shown when Will and Tom take an air bus) is stark. One of the most fascinating aspects of Leave No Trace is how it shows what life might be like without the trappings of modern technology. Will and Tom live without electronics. They have a propane stove but rarely use it. They live off the land and can survive regardless of the climate. They are resourceful and seem happy. It’s a reminder about what really matters in life. By design or accident, no human will leave behind a lasting footprint. Whether the CEO of a major corporation or living in a tent, all traces of existence will eventually vanish. Life is about evolving. It’s about finding the path forward. Leave No Trace is an honest chronicle of one such instance. Occasionally uplifting and sometimes heartbreaking, it is nothing less than sublime.